Meet our Employees - Welcome to Puzzle Pieces! Meet the wonderful people who support our clients at Puzzle Pieces! My Name is Amber Center Etherton and I have been working at Puzzle Pieces since August of 2013. I am engaged and have 3 wonderful kids. I graduated college in December 2013 with a Bachelor's in Psychology. My inspiration for working with people who have special needs came from a little boy that I started watching in 2009. He has autism and just watching the progress that he made day to day with communicating and doing things independently amazed me. Working at Puzzle Pieces has taught more patience than I've ever had before and has given me a sense of pride that I've always longed for. I love the relationships that I've built with my clients and I love being able to teach them new things each and every day. I hope to continue to build on the current relationships I have with my clients and create news ones all the same. I'm more than excited about all the places that I've seen Puzzle Pieces go and all the places that we are headed that are unknown. My name is Kristen Thompson. I am 31 years old, married to my husband, Jamie and we are currently in the process of adopting our first child! I have been employed at Puzzle Pieces since January 2016, where I am the director’s assistant. I was first introduced to working with special needs individuals at a young age. My neighbor, Lauren was born with spina-bifida and I started babysitting her when I was 15 years old. At that point I knew I wanted to work at a place that allowed me to make a difference in other’s lives as my career. I have learned so much since I first started working at Puzzle Pieces and truly feel that working here is a blessing. I have not only built an incredible relationship with my director, Amanda, but also with my co-workers and the clients we serve. I am honored to be part of the Puzzle Pieces family and am excited to see this organization grow! ​Hey, everyone! I am Kelsey Whitaker and I have been a Direct Support Professional here at Puzzle Pieces for 3 years. I am currently a student at Brescia University pursuing a major in Special Education with an emphasis in Middle School Mathematics. I’ve had a passion for helping individuals with special needs since a very young age. Throughout my entire 4 years of high school, I participated in Adaptive PE Peer Tutoring. I learned a lot through Peer Tutoring and continue learning more throughout my schooling, but I have learned even more and been provided with so many hands-on learning experiences since I began working here. 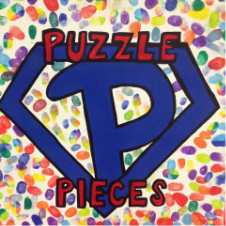 Puzzle Pieces has forever changed my life and allowed me to build some amazing friendships with my co-workers, the parents, and most of all the incredible individuals I get the privilege of working with every day! ​My name is Makenzie Jackson. I am a freshman at Brescia University and am majoring in Special Education and Elementary Education. I have worked at Puzzle Pieces for six months and have enjoyed every minute of it. I found my passion for working with individuals with disabilities when I became involved with my high school’s peer tutoring program. The highlight of my day was having the opportunity to help and interact with these students. This experience altered my life for the better and led me to pursue a career in Special Education. In this, I found my two biggest inspirations; one of which was a student and the other, a teacher. This particular student showed me that despite obstacles in life, there is always a reason to be happy and encourage others. I worked closely with this student for two years and formed a bond with him that I will always cherish. My second inspiration is a teacher that I had the privilege of being a peer tutor for. She is constantly thinking of new and innovative lessons and activities to best facilitate her students and is exactly the kind of teacher I will strive to be. She is one of my biggest role models and in that short year together, I learned so much from her. Working at Puzzle Pieces has been one of the best decisions I have made. It has prepared me immensely for what to expect in the future. In addition to this, I have made an abundance of new friendships with both the clients and staff. I am blessed to work with coworkers who share the same passion as I do and work tirelessly to be the best at their job that they can be. The clients I have had the privilege of working with have further assured me that this is the profession I undoubtedly want to go into. They have taught me so much about compassion and tolerance. It is truly a blessing to work at Puzzle Pieces and I couldn’t imagine working anywhere else. I'm married and have 2 children. I began my journey at puzzle pieces in June 2017. This is my first experience working with individuals with disabilities. My clients have taught me so much since I started. I love my job and getting to build relationships with my clients. As the saying goes "Choose a job you love and you'll never work a day in your life."